Dealers wonder: Where's the company headed? Ford CEO Jim Hackett seeks to drastically change the way the 115-year-old automaker is run. DETROIT — Ford Motor Co. says it has a plan under CEO Jim Hackett to improve the automaker's profitability and competitiveness. But Ford has had a tough time getting others to understand and gain confidence in the early stages of Hackett's companywide restructuring. Investors pushed shares of the company below $9 last week to their lowest closing price since 2009, when most of the company's assets were in hock and the industry was only starting to recover from the recession. Dealers hope to finally hear more concrete details at a meeting this week that will be Hackett's first time addressing the company's broad retail network in person. "There's been a lot less exposure to senior management," said Jack Madden, owner of Jack Madden Ford in Norwood, Mass. "There's just not enough information flowing down to dealers about where the company's headed." Meanwhile, more turmoil is creeping into the company's ranks after Hackett told Ford's 70,000 salaried workers around the world that the $11 billion restructuring will include job cuts, while giving no specifics on numbers and only a vague idea of how or when. Ford is calling changes to its employment structure an "organizational redesign" and says it could take months to complete. Hackett is no stranger to layoffs — he axed thousands of employees at his former company, Steelcase, including the best man from his wedding — but stretching out the process, instead of announcing the cuts all at once, threatens to sink morale and create an uneasy, disillusioned work force, experts say. "The approach they've taken can create a lot of anxiety and stress for their employees, particularly heading into the holiday season," Chris Zatzick, an associate professor of management and organization studies at Simon Fraser University in British Columbia, told Automotive News. "To have that uncertainty and not know what's going to happen in the new year can be quite impactful and can potentially lead to employees looking for other jobs or withholding effort." Ford argues the approach gives managers throughout the company more power to shape their departments, flatten command chains and cut out bureaucracy. They wanted to get ahead of potential rumors that would arise when workers would see their team leaders pulled into meetings — which they call "design sessions" — with higher-ups. "It's really about redesigning the business," Ford spokeswoman Karen Hampton told Automotive News this month. "An outcome of that is that there's likely to be reductions. The real purpose is to change the way we work." Paring back its salaried ranks is the latest shake-up under Hackett, who replaced Mark Fields in May 2017. Hackett seeks to drastically change the way the 115-year-old automaker is run, developing new vehicle architectures, redesigning its product lineups and shortening its order-to-delivery process. Its North American product team, for example, has taken over the 11th floor of Ford headquarters for weekly, daylong meetings examining the profitability of each nameplate one by one. And last week, Ford announced a seismic shift to its advertising strategy, saying that BBDO would replace WPP as its lead creative agency. WPP, which has worked with the automaker since Henry Ford was president 75 years ago, will retain some work as part of a new multiagency model. None of the moves have impressed Wall Street. Investors have raised concern over Ford's financial outlook since the automaker in July cut its full-year profit forecast and canceled an annual investor day because it didn't have enough details to share. Ford communicated the impending cuts to salaried employees through a video message that was met with confusion by some who struggled to understand its meaning. Ford insists the message was not about job cuts and said employees have appreciated the way it is handling the news. "In Ford's history, we have streamlined organizations but we rarely removed work, causing each team member to have to do more with less," Hackett said in the video, according to a transcript Ford provided. He told employees the upcoming changes would be made using "a cascading process that will involve many of you" and that they will work to eliminate "low-value" tasks. "While redesigning the organization is important and it's necessary work, it's not going to be easy," he said. "But it is fundamental to us becoming the business we need to be." Denise Giraudo, a partner in law firm Sheppard Mullin's labor and employment practice group, said more employers are starting to communicate impending job cuts earlier in the process. "We tend to tell our clients more notice is better," Giraudo said. "It does put the employees in limbo, but it also allows them to prepare for a possible layoff, look for different positions and prepare themselves monetarily." The announcement is a departure from how Ford and Hackett have handled similar actions. While CEO of Steelcase, Hackett eliminated around 12,000 jobs as the company transformed from a traditional furniture maker to embracing new open-office designs. He was known for personally meeting with affected employees and helping them get back on their feet. During Fields' last week as CEO in 2017, Ford said it would ax 1,400 salaried employees in North America and Asia through voluntary early retirement and special separation packages. It provided details into what departments would receive the buyouts and said decisions would be made within four months. Although the latest changes are likely necessary, the manner in which Ford notified employees could damage morale, according to Carol Olsby, a human-resources consultant and author. "In an absence of any information, it's stressful," she said, noting the news could have a significant ripple effect on Ford's supply chain and the communities where its workers live. "People are going to be looking for more direction from the company." 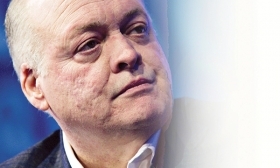 Ford's dealer network also is eager for more direction from Hackett. He and his team will answer their questions this week at Ford's national dealer meeting in Las Vegas. The company expects 4,000 to 5,000 dealers and dealership employees to attend. Over 28 hours, they'll hear from executives; see new products, including the next-generation Escape and Explorer; preview accessories for upcoming off-road utilities; and get to drive or ride in vehicles such as the upcoming Ranger midsize pickup and the GT supercar at the Las Vegas Motor Speedway. Retailers will hear about Ford's sales strategy for its newest products. And they'll get the first glimpse of an advertising campaign debuting in the fourth quarter that's expected to use the slogan "Ford Proud." "It's the right medicine at the right time," Rhett Ricart, CEO of Ricart Automotive Group in Groveport, Ohio, and a Ford dealer council member, said. "I think it will be a huge jolt for dealers' attitudes."